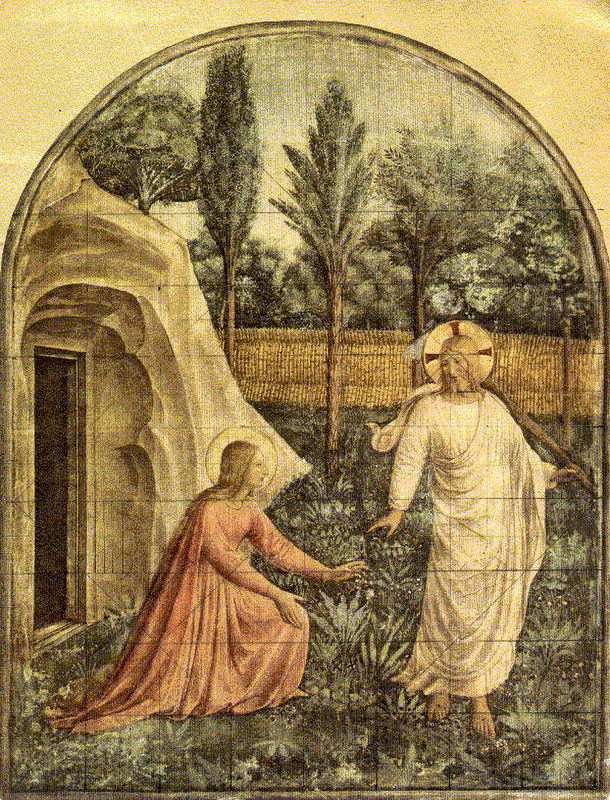 Fra Angelico: Jesus Appears to Mary Magdalene. Are the true Christians those who claim that God’s only revelation to suffering humanity began and ended with Jesus Christ? Is this what makes them true Christians – their absolute, dogmatic insistence that Jesus was the only savior that God has ever sent and will ever send to the world for all eternity? Many people define Christianity in terms of their loyalty to Christ; and most of them measure their loyalty by the firmness with which they reject other paths. It’s a narrow and contractive kind of loyalty that many people proclaim, often because it’s the only loyalty they’re able to cling to. Doubts can be very damaging to our faith. Nevertheless, it’s an inescapable fact that as we grow spiritually we eventually reach a point where we begin to question – not destructively, but because we want to experience the truth for ourselves. In the larger span of our spiritual development, we evolve through mineral, plant, and animal stages until we reach the human level, whereupon we acquire the ability to learn from our actions and make decisions based on our understanding of what will bring us happiness, and what will only bring us suffering. The great beauty of God’s love is that it’s given equally to all, and that there are so many paths by which we can come to Him. And the nature of the path to which we are drawn will depend on where we are standing on the long scale of spiritual awareness. There are levels of spiritual evolution where extremely subtle gradations of awareness are possible, and where we can understand reality from many sides without losing our own inner direction. But in the beginning of our search, there are stages where we need to cling with all our strength to what we’re able to perceive at that stage, because the slightest deviation or subtle nuances might undermine our faith. I’ve shared with you how I was on a radio program years ago when I was living at Ananda Village. They invited me to come and talk about our organic gardens, our schools, and our country lifestyle. I only discovered after I arrived that the man who would be interviewing me was an extremely rigid fundamentalist Christian. He had had a difficult childhood, and he’d become addicted to heroin and was thrown in jail, and then he got religion and became a Christian in the most narrow-minded way. He couldn’t allow any doubts or waffling, and everything had to be absolute, because the only alternative to his rigid belief system that he could see was the abyss. So he definitely hadn’t invited me for my spiritual views. But while we were chatting before we went on the air, I told him something of my spiritual commitment, and he told me about his. And that was when the poor man realized that the heathen had gotten in amongst them, and that he was going to be giving the heathen precious airtime. So it was a tremendous dilemma for him and a crisis of conscience, and he felt obligated to confront me on the air, and challenge me to accept Jesus Christ as my only personal savior. I really didn’t know what to do, because on our path we believe that it’s very wrong to undermine anybody’s faith, however narrow-minded or ill-informed. You could be the most fanatical Christian on the planet, and compared to being addicted to heroin, it would be an enormous step forward for you. So I couldn’t dispute him, and he couldn’t let me get away with being what I was. Finally, I said, “I am not going to discuss this with you.” I said, “My spiritual beliefs include yours but yours don’t include mine, and I don’t see where the conversation can go.” So I stopped talking and went into silence, on live radio. We sat there for a time until he became convinced that I meant it, and then we went back to talking about organic gardening and goats and so on. And it was an extremely instructive experience. The man was too nonplussed and bewildered to answer, so he turned and walked away. We can only start exactly where we are standing and take our own next step. And the tremendous power of Self-realization is that it’s so all-embracing, which of course is why fundamentalists like the man on the radio cannot even begin to understand it, much less embrace the idea of a “church of all religions,” as Yogananda called it. They’re at a point in their spiritual evolution where everything has to be clearly defined, and where they need an clear map that they can follow, so that they can push with all their might to match their behavior and beliefs to that external form. At that stage, it’s the best way they can make spiritual progress, because their awareness is expanding from where it previously was – perhaps living as a heroin addict, or simply leading an ordinary life with a very contracted view of reality. “This is what you must do if you want to be saved.” You need to obey the priest, and you need to understand the teachings in this unyielding and narrow-minded way, and you need to go to church and say these exact words. It’s a stage where you need fixed beliefs, so that you can get them all nicely lined up in your mind and know exactly what you have to do. I’m a Methodist, I’m a Jew, I’m a Muslim, and my beliefs and my behavior are laid out for me clearly. But then at some point in your search, and it’s a very long process to get that far, your self-consciousness develops to an extent that you start to reflect on what’s actually happening to you, and you begin to sense that there’s a disconnect between the external forms and who you really are. You see people who purport to be very religious and dedicated to their chosen path, but they’re behaving hypocritically or cruelly or fanatically, in keeping with their nature at that point in their actual spiritual evolution, and the idea that they are calling themselves spiritual becomes repugnant to you, and you may even reject the idea of spirituality altogether. The last time I spoke on this topic, I picked it up from the part of the reading that talks about reincarnation, and how we live for a time in one form, learning the lessons of that stage, before we move on. Reincarnation plays a tremendous role in any true understanding of the spiritual life. Because if you believe that you’re only born once, and you have only one shot at salvation, and you were lucky enough to be saved, and everybody else is going to be damned for all eternity, it’s a very strange concept of God. And anybody who’s sufficiently self-aware is going to reject that very uncompassionate view. But if you start with the idea that it isn’t the external forms that determine your spirituality, but it’s who you are in your consciousness, then your definition of what’s “spiritual” is going to be very different. And, of course, if we’re looking to merge our consciousness with the Spirit that dwells within us, we are not going to be looking for any kind of outward authority to tell us what we should be doing so that we can feel righteous and good and appear to be so in other people’s eyes. This is the power of Self-realization, and it’s one of the many reasons Paramhansa Yogananda came to this country at this time: to put the whole responsibility for our spiritual growth in the only place it has ever really been, in our own hands. Yogananda said that the spiritual path is fifty-percent God’s effort, twenty-five percent our own effort, and twenty-five percent the guru’s effort on our behalf. And, of course, God and guru want to help us, but they can only help us to the extent that we are asking from the deepest, most sincere place in our heart. There were many things I could have said to the radio host, but he wasn’t ready to listen to any of it, and it would have been a tremendous imposition on his free will if I had tried to heap a lot of information on him that he wasn’t eager to hear. When I visited my parents in Southern California, I accompanied my father to the Jewish synagogue on Yom Kippur, and it was immediately apparent to me that the rabbi wasn’t interested in Self-realization. He was a hearty, externalized sort of person, and he was so dull. He went on and on, and I may be mistaken, but I think you have to remain in the temple for so many hours on Yom Kippur. So it was a kind of nightmare session, where you were allowed to chat and go in and out, and people were hanging around so they could get an automatic blessing, while they were fidgeting and talking and reading books because the rabbi was so dull. In the meantime, I was looking at the prayer book, and realizing that it was really hot stuff. It was filled with wonderful poetry and philosophy, and it was so terrific that I had an irresistible urge to walk up to the rabbi and tug on his sleeve and say, “Give me ten minutes – I’ll wake them up!” But I felt that he wouldn’t understand, and I wouldn’t be able to convince him, so I desisted. But the point is that the spiritual path is about our consciousness. And all of the rituals, dogmas, formulas, and lines of spiritual authority that are valid and helpful at one stage of our journey, are really only useful to us to the extent that they can help us expand our awareness. Of course, there are people who are a lot farther up the road than we are, and it behooves us to listen to them, because they’ve had a lot more experience and they know more. So even after you’ve realized that God has put a very great portion of the responsibility for your spiritual progress in your own hands, it doesn’t mean that you’re suddenly cut off from a need for higher guidance. The reason he couldn’t imagine himself saying those words is that he simply couldn’t imagine that so much divine wisdom and love and joy could exist in a human being. But he had enough self-awareness to know that he needed help. And, as he put it, he suddenly saw someone who could help him, and what could he do but ask for his help, and then strive with all his heart to understand what it meant to receive it. Now, what every one of us is looking for when we set out on our search is a point of peace, a point of rest, a point of joy, and a cessation of suffering. Regardless of the words we attach to it, we have an image of a state of consciousness that is supremely desirable and fulfilling. For the radio host whose life had been ripped to pieces by heroin, his addiction was a reality that superseded all others, because it had literally destroyed his capacity to be himself. And to emerge from that living hell and suddenly find himself loved by Jesus was the most meaningful thing in the world. And despite the depths to which he had fallen, he was much farther along than lots of people who haven’t sunk that far and suffered in that way. And yet, in the final analysis, the stage of awareness that we’ve reached is not nearly as important as the fact that there is a force that is pulling us along. It may be pulling us through our desperate longing, or tugging gently at our sleeve, but it’s pulling us all in the same direction. The Bhagavad Gita describes Self-realization as a process of freeing ourselves from the desires that take us away from the path that can take us to where we want to be. Now, desire has a mixed reputation. On one hand, our entire society is based on desire. Everywhere you look, the culture is trying to feed our desires and encourage us to develop even more of them. Everywhere you turn, the culture is vibrating with the silent call: “Eat me, buy me, take me home!” And when we’re making an effort to rest in our inner self, but everything around us is working against that effort, it’s a battle for true happiness. It doesn’t have to be a massive desire for heroin or unbridled promiscuity that we’re fighting against, or an all-consuming craving for wealth and power. It’s a subtle force that is constantly trying to take us out of ourselves and make us forget all about our inner peace. We live in a physical body and we interact with the world through the physical senses. And because the senses give us pleasure, we’ve become identified with the body, and we don’t know how to unhook the system and escape. We are bombarded daily by stimuli from our senses of touch, taste, sound, smell, and sight that give rise to an endless stream of desires, augmented by countless memories of our experiences in the past. And when we’re trying to enter the inner stillness, it takes a great deal of patient, quietly insistent effort to calm the heart where those desires reside, and free ourselves from that constant twitching. In the Yoga Sutras, Patanjali talks about how the mind jerks from one thing to another. You’re starting to go deep in meditation, when you suddenly think of burritos and you slip away, because the senses have given you a memory of the wonderful taste of the burrito you enjoyed last Thursday. The mind remembers, the intellect interprets, and the desires kick in and fill the heart with restless yearning. That is the very definition of the spiritual path – the absolutely crucial, life-or-death struggle to calm the restless heart. Swamiji said that people talk about calming the mind in meditation, but it isn’t the mind that needs to be calmed, it’s the heart, because the heart is the source of our restless desires. The heart is busy dwelling on what it wants, or worrying about our sore knee, or wondering what our friends are doing. And it’s all driven by the restless feelings of the heart. Swamiji exemplified the teachings of Self-realization for us by modeling how they operate in the real world, and by showing us how they offer solutions to every one of problems we face in our lives. Instead of endlessly stimulating our desires in a vague and futile hope that they will finally give us happiness, we might, instead, simply decide to walk away from it all. We might decide to go to the Himalayas, or shut ourselves off in a monastery. But these options are no longer as attractive to us as they formerly were. And when God sent Yogananda to the West to inspire us with a new revelation, it wasn’t wrapped in those older models of the spiritual life, nor was it how he lived the teachings. It’s certainly not how Swami Kriyananda modeled the teachings for us, because Master gave him the very active role of developing spiritual communities where householders and families and children and monastics could all lead a life of equal dedication to God. In the world at this time, we have to earn money. We have to make our relationships work, and we have to educate our children and help them work out their destiny. We have to find land and build homes and dress in acceptable ways. And in the midst of the daily battle to fulfill all of these duties, we may wonder: “How could we have thought that this would be a good idea? How could God have put us in this situation? Where is my Himalayan cave?” But that isn’t the life to which God has called us. In the beginning of Ananda, I lived in a tiny trailer at the monastery. I would open my door, which hung a little bit askew, and walk down the wooden steps that I had built, which were just about the worst example of carpentry you could imagine, and then I would find myself standing in the middle of the forest, about twenty yards from the spigot where I got my drinking water. I was living in luxury, because the other nuns had to walk farther to get water from the tap. There was a small hole in the floor of the trailer where the grass would grow through, and as far as I was concerned it was useful because it served to keep the trailer nicely ventilated. But that’s how we lived, and I loved it. When you have lots of money, you can insulate yourself against the world by surrounding yourself with solid things; but we couldn’t do that. We could put up a wall that was barely thick enough to keep out the rain, and that was all. And I loved every minute of it. Swami, however, had a geodesic dome that cost $5,000, which seemed like a phenomenal amount of money at the time. The dome was actually big enough to walk around in, although it leaked like a sieve. He had bare plywood floors, and everything was as cheap as it could possibly be. But it was a lot more than the rest of us had, and it was suitable and appropriate for the work that God had given him to do. He would take trips to San Francisco on occasion, and he would go out to dinner, which was beyond our means. And, oh my gosh, some people thought he was living so high, and so far from the ideal of a world-renouncing yogi. And, gosh, he even had a generator so that he could run an electric typewriter. But his life was as simple as he could make it, because it was exactly what he needed, and no more. The first car he looked at was a Buick that he thought might serve, but then he noticed that the people in the brochures were looking so smug and proud and self-satisfied because they were driving this big car. So he decided that he didn’t want to be associated with those people, and he bought a Ford that wasn’t exactly poor but in the mid-range. In the midst of that difficult time, when Ananda was starting, Swami traveled around the world, and he bought beautiful paintings and chandeliers that are still in Crystal Hermitage. And the point I want to make is that through it all his vibration never changed, and I never, ever saw him the slightest bit attached to any of it. He was absolutely at peace within himself, and his vibration never shifted in the slightest degree. He met an Italian painter, Guido Odierna, and they became friends. Swamiji said, “I could furnish Crystal Hermitage with his paintings and help this wonderful artist.” So he bought thirty of the man’s canvases, and he manifested the money to do it. He didn’t have the money when he first had the idea, but he decided that it was the right thing to do, and through it all his vibration never changed. What is my destiny? What is my karma? How can I serve? What is appropriate? And simply rest in the heart, so that no matter whether we’re living in a Himalayan cave or a jewel-encrusted palace or in the hustle and bustle of Silicon Valley, we are not letting our lives be defined by what our senses are receiving. Our goal is to hold to the Spirit and live in this world as God inspires us – never compelled, but always guided and inspired. And that is the key and the secret of the spiritual path for this age. God bless you.